FREQUENTLY ASKED TRAINING QUESTION (FATQ) When can I stop using food to train my horse? Je vindt de Nederlandse vertaling hier: Veelgestelde trainingsvraag "Wanner heb ik geen voer meer nodig?" One of the first questions many new students ask me is “When can I stop using food?” Weirdly enough I have never seen anybody ask a riding instructor or a ‘natural’ horsemanship trainer when they can stop using pressure with their horse, but as soon as you are training a horse by giving him something he likes, rather than using discomfort and pain, people seem to be in a hurry to stop giving that horse something desirable. I do not blame the people that ask the question, but the equestrian world itself. We all learned (except for the few lucky ones) to ride and train horses through coercion. Using food may feel alien at first and many popular trainers have criticised the use of rewards by calling it ‘bribery’, saying that the horse won’t ‘respect’ you and that it will teach him to bite. We also been told that horses should do things because we ask them to and that they should be happy to please us. This romantic idea, that completely ignores the science of learning, is an obstacle to change toward a more humane and scientific way of training horses and the reason why there are so many unhappy horses. So obviously the previous paragraph didn’t answer the question but I hope that it made you, the reader, question other practices and mind set in the equestrian world. To go back to the question, when can I stop using food in training, the answer depends on whether you’re thinking of training in general (teaching something new to your horse) or if you’re wondering when you can stop giving food for the skills you have taught, or currently teaching. I will get the question regarding general training out of the way first because the answer is short: you don’t. The most humane way to teach animal new skill is to use non-coercive methods and positive reinforcement is a predominant one. So every time you teach a new skill to an animal you must be prepared to use food. This being said, you can equally use scratches to teach a skill to your horse (see 'further reading') however for efficient training you will need to be ready to use food rewards too when necessary. Now for the second question, when can I stop giving food for the skills I am currently teaching or have completely taught successfully. Once the horse knows the skill you can change the schedule of reinforcement from a continuous reinforcement schedule to a variable ratio schedule. What does this mean? A schedule of reinforcement is a plan, which determines when and how often reinforcement is given to a horse for a behaviour. Whether you are familiar with this term or not, anyone that have trained a horse uses schedule of reinforcement. When training a horse you use a continuous reinforcement schedule. This means that every time the horse does the desired behaviour, he is reinforced. For example: If you’re teaching a horse to give you his feet, you will reward him every single time he does it. Once the horse knows the skill you move on to a variable ratio schedule, this mean the number of behaviour the horse does to receive a reinforcer varies. For example: You will reward the 3rd time the horse gives you his feet, the 9th time and the 11th time. This is a good schedule because the horse cannot predict when he will be rewarded. There is very short post-reinforcement pause as the horse learns that he may have to offer fewer behaviours to achieve reinforcement. Eventually you will find yourself giving a food reward only once in a while and then you will switch to real-life rewards. Real-life rewards help maintain learned cues and behaviours without you needing to provide handfed rewards. Spirit, the little pony that I rescued last year (February ‘14) was previously afraid of human and couldn’t do the most basic tasks such as accepting to be touched, groomed, lifting up his feet, accepting a head-collar, leading etc. He was entirely re-educated using positive reinforcement at liberty. All these behaviours are now maintained by real-life rewards. For example, putting on the head-collar can lead to going on a walk. 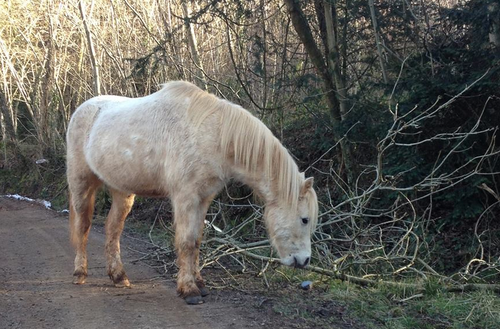 (Walks help fulfill a horse natural need for exploration and give him the opportunity to browse and graze). 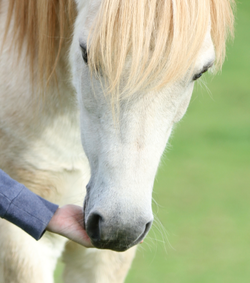 In a training context, doing one behaviour may give the horse an opportunity to do another behaviour that lead to reinforcement. For example, you may no longer give reinforcers for your horse to trot on cue but you give him food when he jumps over a fence. In this scenario trotting leads to jumping the fence, which lead to reinforcement.